This article originally published on Feb. 21, 2015. We all know the importance of setting goals – they hold you accountable, tell you what you truly want and help propel you forward. Whether you strive to get started on that new project, spend more time at home, launch a new product, or want to lose weight, many of us simply state our goals but fail to set deadlines and track our progress towards achieving our goals. Integrating your goals into your digital life is an easy way to keep your goals top of mind and help keep you motivated. Some apps even allow you to make your goals public, helping to hold you accountable and garner support from friends and family. GoalsOnTrack (Free / Available for iPhone, Android, Blackberry, Windows Phone 7). Relying on best practices in psychology and personal development principles, this goal-setting and personal-productivity app guides you through the process of goal setting – from recording your goal, its purpose, start and end date, to creating an action plan and tracking progress. Use one of GoalsOnTrack’s goal templates and customize your own action plan, then track progress by placing a checkmark beside completed tasks. This app also has a built-in goal journal allowing you to record your progress and a habit tracker that provides a visual guide of your successes. LifeTick (starting at $2.50/month for individuals or $14/month for business / Available for iPhone, Android and iPad). This goal-tracking app asks you to begin by establishing your core values, then similar to GoalsOnTrack, asks you to follow the S.M.A.R.T (specific, measurable, assignable, realistic, time-specific) goal-setting method and create tasks or steps that are required to achieve your goal. Check off achievements and review them in a date-sequenced journal of all of your goal-related activities. Unlike GoalsOnTrack, LifeTick allows you to invite others to view your progress. Your personal cheering squad can view your progress and add comments to keep you motivated along the way. 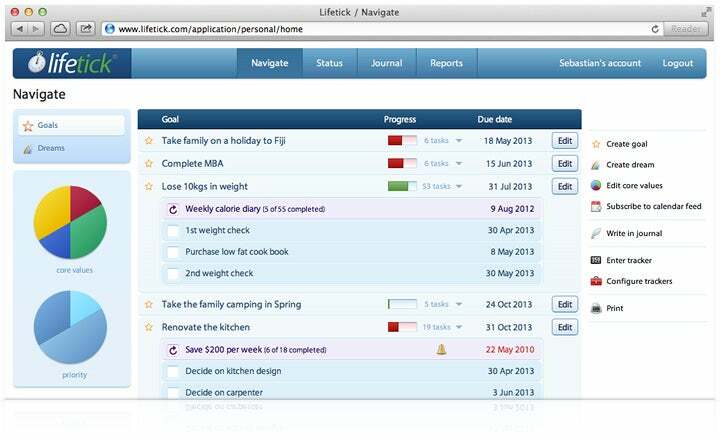 There’s also a LifeTick for business so you can set team goals, assign tasks and track each individual’s progress. Habit List ($3.99 / Available for iPhone). 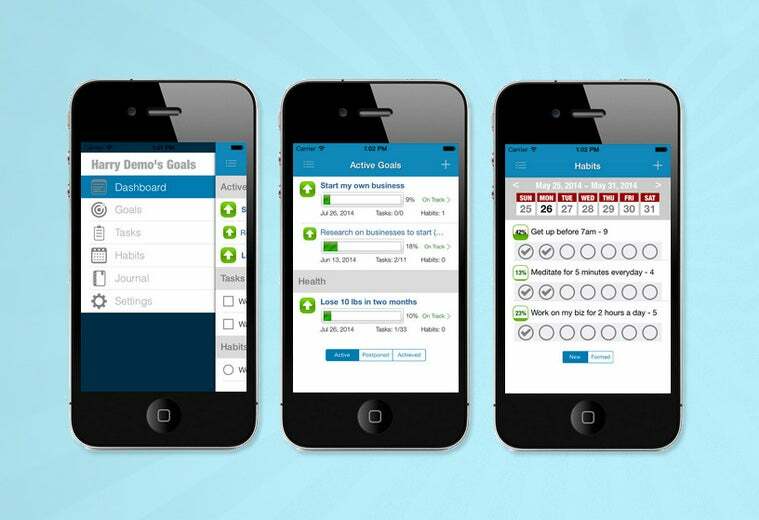 This app helps you track your “streaks” – how many times in a row you completed a habit. You can create flexible schedules for habits that are to be done on specific days or intervals (such as writing a blog post twice a week or hitting the gym every Tuesday and Thursday). Habit List will send you reminders to keep you on track. Irunurun (Free for personal version / Available on iPhone and iPad). 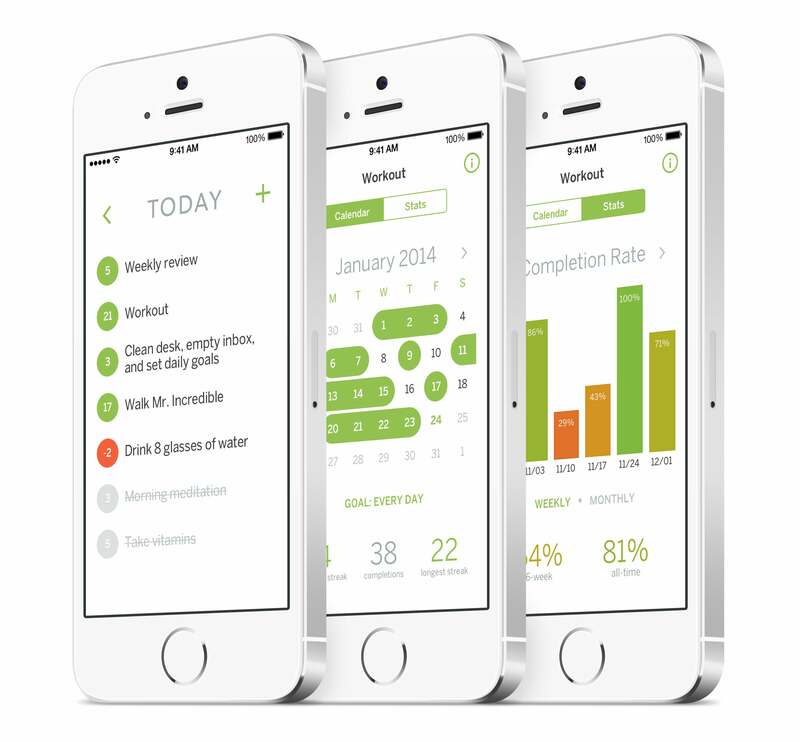 This performance and accountability app argues actions speak louder than goals. Begin by entering the action, or habit, you want to track. Then weigh the action by assigning it a point value out of 100. Your score at the beginning of the week will start at zero and will increase as you complete actions. If you complete each action entered at the appointed time each day, you would earn a perfect score of 100 for the week. This app also allows you to share the experience with others. Invite friends, family or colleagues to any action and build an accountability team so they can encourage your progress. 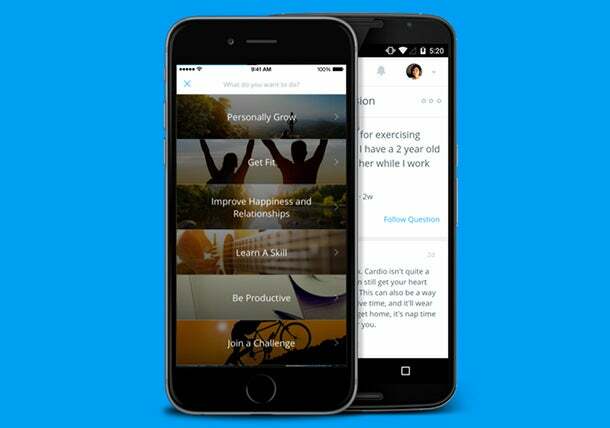 Irunurun makes three versions of this app – for personal, team and enterprise use. Lift (Free / Available for iPhone, Android). This app begins with the premise that goals are most easily achieved when we’re being held accountable by others. Using crowdsourced encouragement, Lift allows you to choose your goals and then select the type of coaching you require: advice, motivation, and/or prompting from the Lift community. You can hire a coach, get props from other users and set up reminders to do tasks. StickK (Free / Available for iPhone, Android). If vision boards and pie charts aren’t enough to motivate you, perhaps you need the stickK approach. This app, developed by Yale University economists, will cost you real money if you fail to reach your goal. A commitment contract binds you to a goal. Set your goal and the time frame you want to achieve it in, then state how much money you want to put on the line and where you want that money to go should you fail to reach your goal. Next, designate a referee to monitor your progress. This person acts as an independent third party who logs into the app to monitor your progress (you can also choose the honor systems and go it alone, without a referee). Need a little extra motivation? 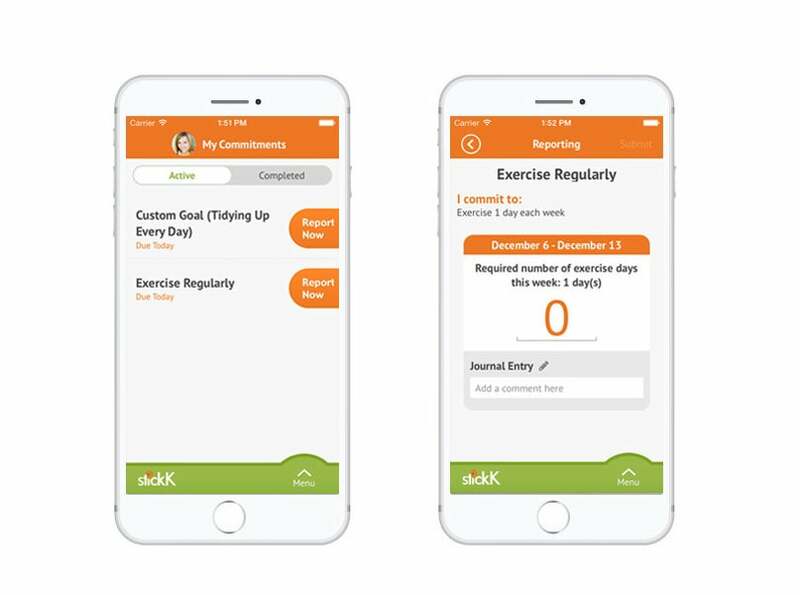 You can also choose to have a panel of other stickK supporters to be your cheering section and post motivational messages in your Commitment Journal – the place where you make daily entries on your progress.